There is a short street in my neighborhood in Santa Cruz, Lemos Street. It is was renamed in the 1940s, to honor an artist who had sold his landscapes of beaches and redwood forests for nearly 50 years in a shop at the Seaside company's Casino. Here's one of his pictures. You can be sure that the original price wasn't anywhere near $600, even in adjusted values. When I travel to touristy areas, I buy little paintings like those sold by artists like William Lemos. Today at Staigue Fort, I found this display. It was hard to choose from among so many lovely ones. The artist wasn't there. I hope she was out painting. 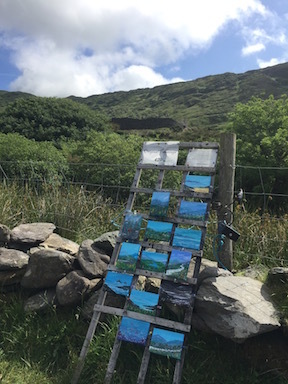 To buy a painting you unpin it from that frame and slide a folded €20 into a slot in a tiny metal box. This is Derrynane beach, where we often visit.